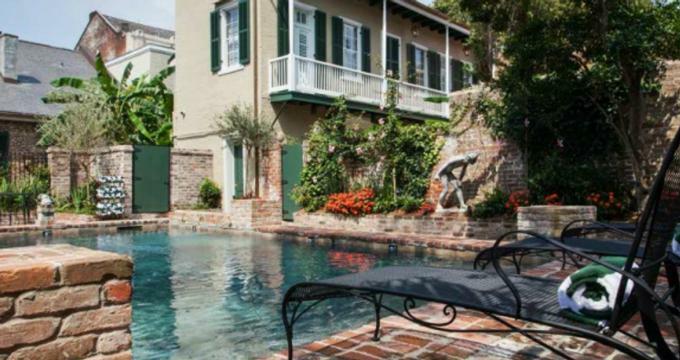 The Audubon Cottages is a relaxing retreat in the French Quarter that exudes the charm and elegance of old New Orleans. Offering unparalleled personalized service, including a dedicated on-site French Quarter Butler, the Audubon Cottages feature luxurious accommodations in the form of seven cottages dating from the early 19th century, one of which was home to John James Audubon, upscale facilities and amenities and delectable cuisine. Facilities at the Audubon Cottages include an outdoor heated saltwater pool surrounded by lush gardens with wrought iron chairs for relaxing. 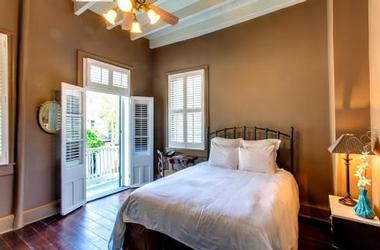 The Cottages are located within an easy walking distance of the famous Bourbon Street and Jackson Square. The Audubon Cottages features luxurious accommodations in the form of antique-furnished cottages and stylish one and two bedroom suites with semi-private or private courtyards. The cottages and suites boast spacious living areas with comfy seating and flat-screen televisions, queen or king-size pillow-top beds with luxury linens and en-suite bathrooms with soaking tubs, walk-in showers, plush towels, waffle cotton bathrobes and slippers, and organic bath products. Modern amenities include air-conditioning, televisions, iPod docking stations, tea and coffee-making facilities, in-room drawer freezer and refrigerator with complimentary beverages, in-room safes, and complimentary wireless Internet. The Garden House features charming bedrooms and en-suite bathrooms, spacious living spaces overlooking the lush courtyard and swimming pool, a small kitchen area, and modern amenities. Once the former residence of John James Audubon, Audubon Cottage One is a lovely two-bedroom suite that features separate living and sleeping areas. One bedroom has a king-size bed and one bedroom a queen-size bed, and both have en-suite bathrooms with each bedroom with walk-in showers, plush towels, waffle cotton bathrobes and slippers, and organic bath products. Audubon Cottage Two is a charming two-bedroom suite that features a master king bedroom with king-size bed and spacious en-suite bathroom with a Jacuzzi tub, double sinks and a walk-in shower. The second bedroom has a king-size bed with an en-suite bathroom and large walk-in shower, while an ample living room boasts hardwood floors, comfortable seating and a dining table with seating for four. Audubon Cottage Two also has a private courtyard with a fountain and wrought iron furniture for relaxing. Audubon Cottage Three is a beautifully appointed two-bedroom suite with two king bedrooms and two en-suite bathrooms with walk-in showers, plush towels, waffle cotton bathrobes and slippers, and organic bath products. The separate living room boasts hardwood floors, antique furnishings and art, comfy seating and a faux brick fireplace and lovely views over the sunlit courtyard and fountain. Located on the second floor, Audubon Cottage Four is a two-story, two bedroom suite features one king and one queen bedroom, each with their own en-suite bathroom with walk-in shower and plush towels and access to a private balcony with views over the courtyard. The lower level of the suite is taken up with a spacious living area with comfortable seating that opens onto a shady, private courtyard with fountain and outdoor seating. Audubon Cottage Five features one king and one queen bedroom, each with their own en-suite bathroom with walk-in shower and plush towels and access to a private balcony with views over the courtyard. The separate living room boasts hardwood floors, antique furnishings and art, comfy seating and a faux brick fireplace and lovely views over the sunlit semi-private courtyard and fountain, which is shared with Cottage Six. Audubon Cottage Six is a delightful one-bedroom cottage suite with a king-size bed with luxury linens and en-suite bathroom with walk-in shower, plush towels, waffle cotton bathrobes and slippers, and organic bath products. Cottage six shares a semi-private courtyard with Cottage Five and both can be adjoined and rented as a three bedroom cottage. Once used as a studio by John James Audubon, Audubon Cottage Seven features a king-size bed with luxury linens and en-suite bathroom with walk-in shower, plush towels, waffle cotton bathrobes and slippers, and organic bath products. 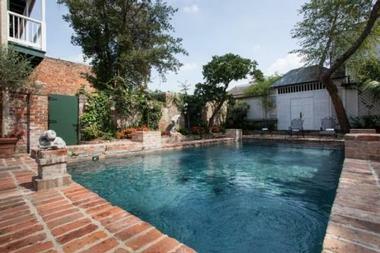 The semi-private courtyard is shared with Cottage One and shares a fountain and wrought iron furniture. A complimentary continental breakfast is served every morning and includes hot and cold choices, fresh fruit juices and fruit, pastries, cold cuts, and cheeses. Amenities at the Audubon Cottages include private, guest-only access to a shared saltwater pool, which is surrounded by beautiful lush gardens with wrought iron seating for relaxing. The cottages have a dedicated on-site French Quarter Butler to offer unparalleled personalized service and cater to guest needs for their duration of their stay, and there are daily housekeeping and turn-down service every evening. Other guest services include a delicious complimentary continental breakfast served every morning, and valet parking. The historic Audubon Cottages offer a beautiful setting for romantic weddings and other special celebrations. In addition to the 18th cottages and swimming pool surrounded by lush gardens, the Garden House is available for various events featuring a full bar, cocktail seating, and a small kitchen area that overlooks the courtyard and swimming pool.